Tester / stroboscope conceived for advance checks, for the diagnosis of ignition and injection systems on petrol engines, for mapping checks while tuning sports and road engines. Advance mapping of ignition and injection as well as injection time can be picked up automatically (without flash) on power test benches or on the road. Simplifies mapping test procedures and shortens mapping times, really helps preparing for homologation on test benches. 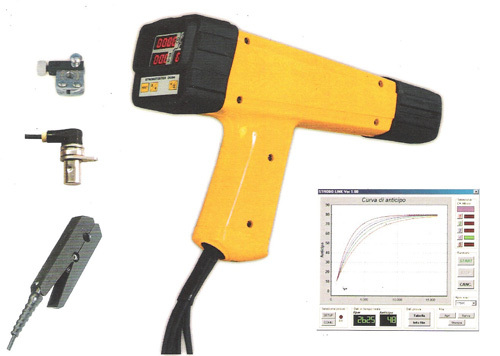 RS 232 connection to PC for displaying and comparing the mapping of 5 different ignition or injection advance curves on power test benches or on the road. Displays at the same time: RPM and ignition or injection advance, as well as injection time, ignition coil's charging time, time and duty cycle of actuators, DC battery voltages and sensors peak voltages. Non contact RPM measurement through stroboscope. Gathers in a single instrument the features of DG89n and other electronic circuits for the automatic measurement (without flash) of pre-injection advance in Diesel common-rail engines. For checking and rectifying pre-injection mapping.